I'm coming to realize that there is a sort of Old Boys' Club in the world of UFO journalism. Apparently one must earn the right to be granted permission to live among these jerks, and I just don't care. There are two things going on right now that are just annoying and ridiculous. First there's the lying liar who has most likely lied to me and has absolutely, positively lied about me, and cost me a key interview for my J. Allen Hynek book as a result; this person now wants to make it up to me and grant me an interview, but why would I want to quote this person in my book? Then there's the person who is hosting a weekend retreat for a council of UFO elders this fall (and, yes, the lying liar is one of them) who is kinda sorta willing to let me attend while making it clear that I'm not exactly welcome... If I go, I have to honor this person's boundaries and pretty much remain mute all weekend, so what's the point? It's like they're the Mean Girls, and I'm Lindsey Lohan. Except we're all old guys. The question is, do I really need to deal with these people to write my book? The answer is no, I do not. I already have mountains of material to use, and there are plenty of people who do want to talk with me... So if these members of the UFO Club don't want me entering their world, why would I want them entering mine? The absence of quotes from these jokers will not hurt my book in the least. On the other hand, part of me is really fascinated by the fact that I'm encountering this weirdness, and wants to know why these people are so hostile. Do I threaten them? Are they pissed that I'm the one writing the book about Dr. Hynek and they're not? I think that's possible, but if it's true it's kind of pathetic. Any one of these people could have stepped up and written this book any time they wanted to over the past several decades, and they didn't. I swear, it's like UFO high school. I have a suggestion for you. You might get more people interested in your blog if it wasn't so focused on J. Allen Hynek. I am sure it is important to you, writing a book on him, but I don't see many comments. I know when I see Dr. Hynek's name I immediately move on. Frankly he doesn't interest me in the least. Myself and I bet other readers would rather talk about other UFO/paranormal matters. It is something to consider. I'm guessing that Mark's "High Strangeness" blog focuses on Hynek due to the fact that he's researching and writing a book on the man, as you note. But, if you read the various posts, you'll find it's actually more diverse than just being a Hynek "hagiographic tracking device." I'm fairly interested in Hynek's history, so while you "immediately move on" when you see Hynek's name, there are others out there who don't. Or shouldn't, if truly interested in the history of and personalities involved in studying the UFO phenomenon. The sociological, cultural, psychological, political, and anthropological aspects, among many others, are quite intriguing, to some. And Hynek was, or could be seen as, a unique kind of "vector," or lens into all of those associated elements. Hynek was a fascinating guy, near the center of the US government's long-term but rather low-level and inadequate _semi-public_ efforts to investigate the UFO phenomenon, and his conversion from a debunking skeptic, serving his USAF sponsor's wishes, to a much more objective observer and researcher of the phenom towards the end of his governmental consulting career is actually very intriguing, as is why, how, and what he did to help reverse his legacy of potential "patsy" for the USAF by founding CUFOS, and his intent in writing his books, both his own, and with Jacques Vallee. Vallee's "Forbidden Science," Vol. 1 & 2, present an interesting, complex, and conflicted, portrait of Hynek just for one example. If you'd prefer to "rather talk about other UFO/paranormal matters," I'd suggest there are a universe of other sites and blogs to peruse, instead, for that purpose, if so desired. Personally, I occasionally like to see and read tightly-focused blogs about specific subjects within the UFO spectrum, as they are usually thus inherently more in-depth and provide a greater wealth of details about the particular topic they cover, unlike more generalized UFO or paranormal sites. Which, in fact, there's a really big "boatload" of online, to say the least. And that, too, is "something to consider." Plus, just because a blog doesn't have "many comments" is not necessarily a sign of either too narrow a focus, since that's a subjective judgement (and you note that Hynek "doesn't interest me in the least"), or that it's not interesting or well-done -- people write blogs for all sorts of reasons -- and a blog author can do whatever he or she wants with one, for their own purposes, right? To each his own. C'est la vie, and all that jazz. They own their own words, as it were. The criteria or factors that should be most considered are the quality of the writing involved, the information provided, and whether it appeals to your interests, or not. Your mileage may vary, or YMMV, as the oldster digerati used to say. 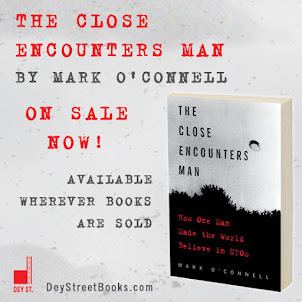 Mark may not care to promote himself that much, or this blog may primarily be intended to be kind of a record, mainly for himself, of his travels and travails through the weird little world of ufology while doing his book research, like an online "diary," or memoir, and not intended for the purposes or broader areas you might prefer. I just discovered this blog myself, think it quite good, and intend to read through much of it, if for no other reason than that I like the kind of humor Mark brings to the subject that so many others within "ufology" don't, or are at least a bit too overly serious about, when regarding the UFO phenomenon and the "culture" that's grown up around it over the past 65+ years. With UFOs, and especially the current state of "ufology," ya just gotta laugh sometimes. Steve , as I stated, there were at least six mentions of Dr. Hynek over the last ten postings or so. There are very few comments. I understand perfectly that Mark is working on a biography of Dr. Hynek. I would just rather not hear about it constantly. Granted, it is his blog to do as he wishes. He just might get more readers if he commented on other subjects and not bring Hynek into the picture. And Steve, can you kindly drop all the internet slang (IMHO, YMMV), it's like a bad joke when you use it over and over. We get it, you are witty and erudite. Thank you both for adding to my comments tally! I appreciate both your points of view, and to be honest, there are times when I worry that I'm trying to do much with this blog. In general, I try to split my content up into thirds: one third dealing with my adventures as a MUFON Certified UFO Field Investigator; one third dealing with my Hynek book; and one third dealing with whatever other odd things may be going on in the world of UFOs. That balance shifts according to a variety of factors. 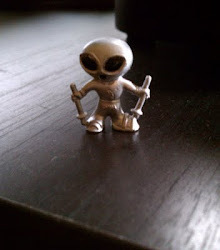 In April and May, for example, I was writing a whole lot about the Citizen Hearing for Disclosure and the Atacama Humanoid, and not much about anything else. Bottom line is, I write about whatever strikes me as fun or interesting that day. I hope you'll both keep following along!